As we are sure you are aware, the General Data Protection Regulation (GDPR) will come into force on the 25th of May 2018. This will apply to all organisations that process and hold personal data of EU citizens residing in the European Union. Localgiving will be fully compliant with GDPR requirements by the 25th of May deadline. We will also ensure that the information you can access through your account is complaint. When a supporter donates to you, we currently ask them to opt-out if they do not wish to receive communications from us or Localgiving members. The consent wording on Localgiving.org is currently: “I do not wish to receive updates from the charity”. We will be changing this to an opt-in preference and seeking consent for all future communications from your supporters. We will also be removing all non-compliant data from your account and reports. What do you need to do with data obtained through Localgiving? Donor consent data collected by Localgiving before 25th May 2018 will not be GDPR compliant. All data you obtain, or have obtained through your Localgiving reports before 25th May 2018 must not be used after this date. You must seek fresh consent for all data collected through Localgiving reports before this date. 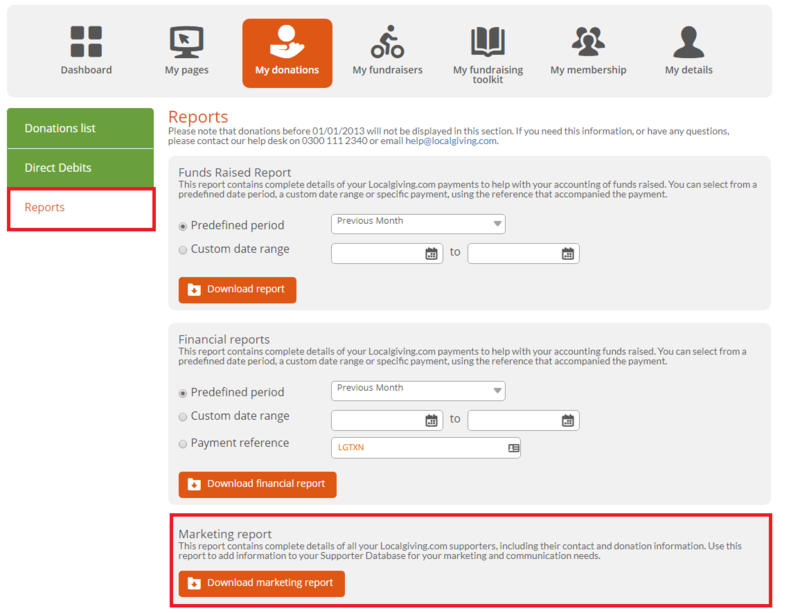 We recommend that you login and download your Localgiving marketing reports as soon as possible. You should then contact your supporters before the 25th May 2018 and ask them to opt-in to your future communications. You will not be able to use this data to contact supporters after this date. Once you have downloaded this report, your charity is the data controller for this personal data and is solely responsible for compliance with GDPR. We strongly suggest conferring with your trustees/Data Protection Officer and other key stakeholders to decide your process for collecting this consent. Login and download your Localgiving marketing reports today. This can be found within the My donations section, click on Reports within the menu on the left. Email all supporters whose data is included in these reports and ask them to opt in to your communications. After 25th May this data will no longer be accessible via Localgiving. How to make sure your organisation is fully GDPR compliant? Getting ready for GDPR is daunting. However, the fines for data breaches will be substantial and so, if you haven't already, it is essential you put your strategy in place now.